Last night, Eric took me to a raw & vegan restaurant in Mississauga called Raw Aura. I’ve been wanting to check this place out for a while now, so it seemed like a good time! I was slightly worried going to a raw restaurant, after my Birthday experience at Live 2 years ago, but I’ve also had a great raw food experience at Rawlicious, so I figured it was worth a shot! 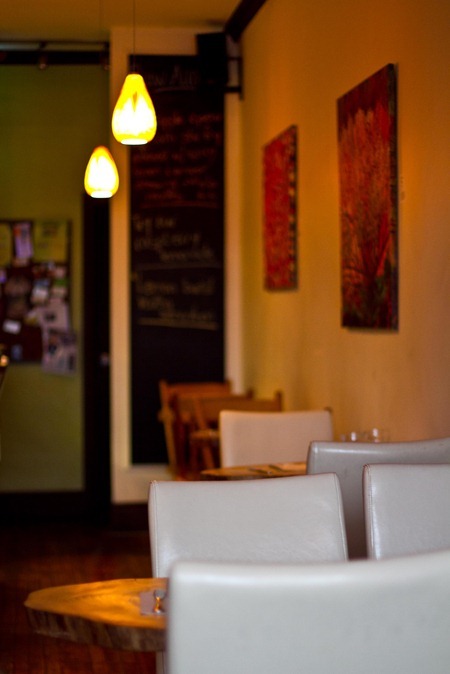 The restaurant is café style, and it is basically a cozy & intimate hole in the wall which is common of many vegan restaurants that I have been to. They prepare a lot of the food right in the dining room. There is seating for about 16 people, so you can see how small the room is. We started with drinks and appetizers. 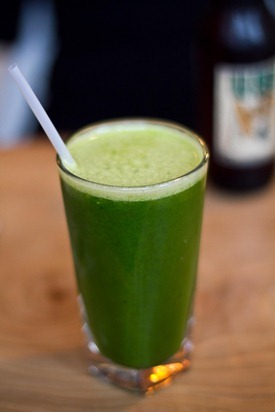 I had ‘The Green Juice’ which was made up of Kale, celery, cucumber, romaine lettuce, parsley, lemon and ginger. My cuppa tea juice! Eric had the Old Credit Amber Ale which was their only beer and he said it was horrible (he is not an ale fan, but if you were you might enjoy it!). Their menu boasted organic beer & wine, so maybe they were running low on beer? For appetizers, we ordered the Kale Chips which were seasoned with a delicious sour cream cashew, red onion, and chive sauce and dehydrated until crispy. They were THE BEST kale chips I have ever tasted! Eric and I both agreed that they tasted just like Sour Cream & Onion chips. We could not detect the kale at all and we polished off the bowl fast. 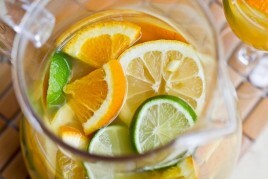 I have to try and recreate these! We also ordered the Nacho Platter which was made up of crispy corn chips, guacamole, cashew sour cream, fresh tomato salsa and walnut taco meat. I put a little bit of each topping onto each chip and it was a party in my mouth. The raw nacho chips were also fantastic…I prefer them to corn chips actually. After our appetizers, we lingered over our drinks while our stomachs settled for about 10-15 minutes before our main entrees came out. I ordered a ‘small’ Big Salad which was a huge mix of kale and romaine lettuce topped with avocado, cucumber, tomato, mixed seeds, red pepper, onions, sprouted chickpea hummus, and a live breadstick. I had it with the Herb Citrus dressing. It was perfect. Creamy, tangy, flavourful, and extremely filling. I loved the ‘breadstick’ too, it was like a thicker and more flavourful Mary’s Cracker. Eric and I both ordered the Pizza, which came highly recommended by everyone I talked to. I figured we couldn’t go wrong with pizza! 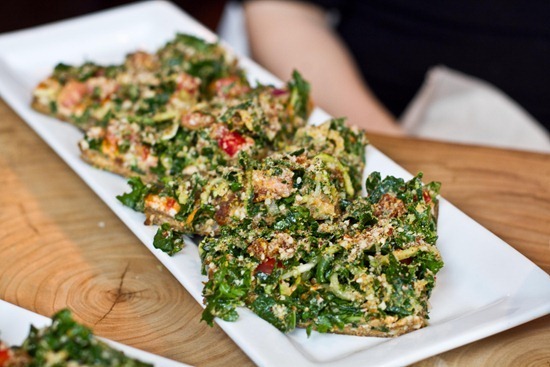 The pizza was on a delicious red pepper and sunflower seed flax crust and was topped with a cashew tomato cheese, kale, zucchini, ‘parmesan cheese’, red pepper, and more. We loved it. It is VERY filling though, thanks to the dense crust and cashew cheese, so we wrapped up some of it to go. The only minor critique I have of this pizza is that it needed to be served warm. Supposedly it was served warm according to the menu, but we both found it cold, or at minimum room temperature. I will definitely be heating up my leftovers today! By this point, we were stuffed, but we wanted a little something sweet to end the meal. They offer a sampler dessert plate for $12 and you get to sample 4 desserts. They know the way to a girl’s heart. 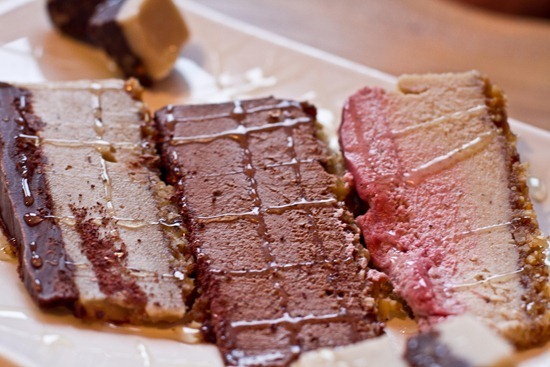 On our sampler plate: Mint Chocolate Ganache Cake, Chocolate Banana Cake, Strawberry Cheesecake, and Brownies. 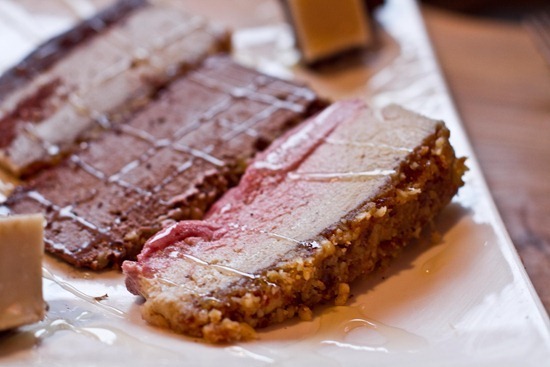 All of the cakes were mousse-like in texture with a nut-based crust. I’m not a huge fan of raw cashew-based mousse cakes, but they were pretty good. My favourite was the Mint Chocolate Ganache Cake (the raw ganache was incredible) and Eric couldn’t decide which one he liked the best. Our least favourite was the Chocolate Banana Cake because we are both not big fans of straight up mousse. The brownies were very rich and just a couple small bites was enough. All in all, it was a great meal at Raw Aura! My favourite Raw restaurant in the GTA is still Rawlicious, but only because the atmosphere at Rawlicious just can’t be beat (see here for my full review and pictures!). If Raw Aura had the same atmosphere, I would say they are both on par. I think the portion sizes at Raw Aura are larger and you get a bit more value for your dollar. We ordered a lot of food and were surprised at how low the bill was! I was also happy not to have stomach pains like I did at Live a couple years ago. My stomach is very sensitive to nuts, but it seemed to be just the right amount in my meal last night. I tried to select dishes that were not completely nut-based so I think this helped a lot. happy . . . and absolutely glowing :) happy birthday!! 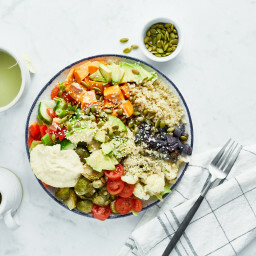 I am in desperate need of a raw, vegan restaurant in my small Ontario city, this might be worth the drive to Mississauga, of course, I will need to stop at Fresh on Queen St on the way. Yummy review, Angela! 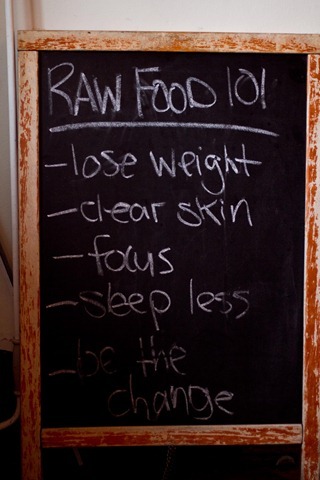 you should also check out Rawlicious if you are in Toronto….awesome! That place looks great…and Happy Birthday!! The entire meal sounds wonderful!! And the photo of you is beautifull!! You really do GLOW!! I was thinking the same exact thing! Such a great photo. You look beautiful I am so glad you enjoyed your birthday dinner I would love to find a raw cafe around here to try. You look SO happy! Happy birthday!!! Great to hear your party and the dinner were filled with love and happiness! woop woop! sounds like you had a great meal. there’s nothing better than leaving dinner and feeling refreshed and not bogged down. I want to eat all that food NOW! what a wonderful evening out! your photo is dazzling! thanks for the review, angela. everything looks fabulous! maybe a spot for a southern ontario blogger meet-up?! Ange you look GORGEOUS in the last photo!! Sounds like a delicious meal (minus the beer of course) and I can’t wait to go. I haven’t done much experimentation with raw food but I feel like it’s something I’d want to try. Thanks for the great review! Angela, my father-in-law (whose birthday was yesterday as well) lives right in Mississauga and we’ve been meaning to go to Raw Aura for ages! It’s so weird to see it on your blog too! Happy Belated Birthday and I hope you had a fabulous time. 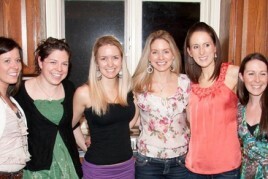 I was so excited to see you chose Raw Aura for your b-day dinner! When you said the place you wanted to go was closed on Monday I thought of it only because I live about 5 mins from it in Port Credit and crave it when they aren’t open!! They have a new(ish) chef and I haven’t been in since but have plans to go with a girlfriend next week. I usually opt for one of their ‘pasta’ dishes (zucchini noodles) as they make a mean cashew cream sauce. Their smoothies and kale chips ARE amazing and dessert is always a tough decision. Glad you liked it, and it didn’t hurt your tummy. I have been to Rawlicious once (the new one in Yorkville) and was equally impressed. it is, too bad the weather was blah. come back in the summer for a nice afternoon/evening! When I moved from vegetarian to a GF vegan (pretty much overnight) due to food allergies, I made the mistake of tons of raw nut pates, raw desserts w/ cashews, nuts in my smoothies and i was in just as much (if not more) agony with tummy issues from all those nuts than i was with my food allergy/gluten issues. It took me awhile to figure that out, too. Love this review and so glad you had a great time!!!! Averie, this is so encouraging for me to hear. I think I am just getting over making a similar mistake. I jumped with both feet into a lot of raw and vegan food for the last few months. And the last month, I have been in excruciating pain when I eat. Although I love and crave all those nutrient rich foods I have gone back to my old way of eating because I don’t hurt as much. I am hoping that I can get myself healed a little and maybe try again with a slower, more careful approach. I was beginning to think that I was the only one who couldn’t do all the healthy foods that I love so much. Gorgeous photo of you!! They weren’t kidding when they that raw food will give you clear skin — beautiful!! I’ve been wanting to try to a raw restaurant but I’m scared. I don’t particularly like all raw veggies so even though I know they’re heated to a certain degree I’m afraid it will be like I’ll be chewing on a raw carrot for dinner. Weird, I know. I think I’ll just try a spot out, living near NYC is really no excuse to not try a few out at the very least! What a gorgeous photo of you, you truly are glowing! Wonderful review Ange! This all looked very yummy!! I’m dying to try rawlicious since you posted, now I can’t wait to try this! Too bad I’m a northern Ontario girl who doesn’t go in the GTA very often! However if your ever in Muskoka, you must must must try the vegan deli in the Natural Food Market in bracebridge! Actually I think their “BBQ Tofu” is worth the drive up and a blog posting! It’s my fav place to go! On a side note, I was wondering if you or any of your readers know any good veggie places in OTTAWA? My boyfriend and I are going there this weekend to celebrate our 2yr. P.S. Made the protien bowl with lemon sauce on the weekend for my Mom and I…AMAZING! Here’s something else for you to try. 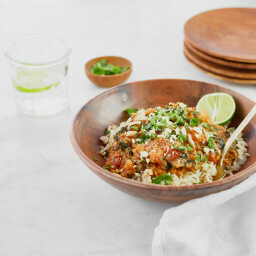 Mix together in blender and pour over a bowl of brown rice, quinoa, or other grain of choice, shredded carrots and beets, almonds, sprouts, avacado and spinach. OR whatever else your heart desires! There is a Green Earth in Toronto and it’s very good, and relatively inexpensive. Vanessa, Your a doll! Thanks a bunch! Will def be checking out the Zen Kitchen! Looks devine! All of that food looks amazing! 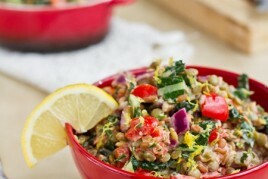 I’ve been intrigued by raw food lately – really need to find a restaurant to try out. I wonder if small town, corn country Iowa has one anywhere?! All that food looks sooooo wonderful! Yum!!! It looks like you had a fantastic birthday! The food looks amazing! Cool! I live in Ottawa but am planning to visit my cousin in Toronto this summer. Gotta check this place out, everything you guys ordered looks amazing. I’m so glad you enjoyed your meal at Raw Aura. I agree their kale chips are the best. Let me know if you’d like the recipe – now that I’ve got you considering some time with your Excalibur. The desserts would have stole the show for me. They look light and heavenly! everything looks so fresh and alive, the colors just scream health! glad you had a great birthday, and the picture of you is stunning! SUCH an adorable photo of you. Gorgeous!!! :) The food sounds great! I’m hoping to try a raw restaurant in Cleveland while I’m home! Raw Aura sounds fantastic! I need to try a raw restaurant someday, the food just looks and is so fresh! That looks like it was a fabulous meal, and you are beautiful! Oh you are a brave woman. I am a visual eater and if it doesn’t look good…I don’t even want to try it. Some of those dishes I could have managed, while a few others…I’m not so sure. heh beauty is in the eye of the beholder I guess eh? Looks like you had a wonderful birthday dinner!! That pizza looks amazing with all its toppings! Angela you look just gorgeous in that last photo! The food looks incredible — I’d be all over that taco plate for sure! You’re seriously stunning. Just breathtaking. This restaurant looks amazing. 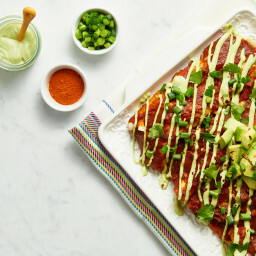 Please recreate the dishes, so I can try them! 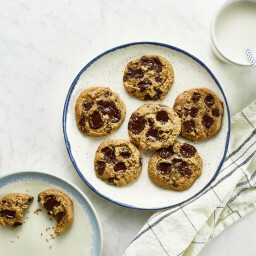 Also, pleeease post if you recreate the kale chips–they sound so good!! So nice you checked out Raw Aura – I have fond memories of eating there many times when they first opened in 2009. I’ve had a chance to sample the food from two of their chefs; Maeghan and Doug. Must make another trip to try out the new food and meet the new staff :) Lovely photos, and glad you had a nice experience! YOU ARE STUNNING AND I LOVE YOUR PRETTY LIL PICTURE OF YOUR LOVELY SELF! :) oh she glows! We have a fabulous hole-in-the-wall restaurant here in downtown Reno called The Pneumatic Diner. 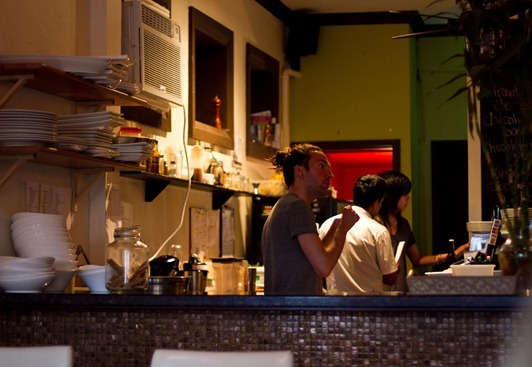 It’s so fun– the kitchen is in the center, with the seating around the edge of the room–only seats like 20 people! I love, love, love their food, and I’ve been wanting to try some of their fresh juices. I’m now thinking that when I get paid again (which should be today) we’re going to have to head on over there…. my sister has never been! I love the feeling I have after I eat there– the food never leaves me in that slump that I get if I eat a big meal somewhere else. Love it! Wow, the food looks great! I’ve never been to a raw restaurant, but it seems like it would be a lot of fun! You look beautiful in that last picture! I love Raw Aura; the chef is always a delight to talk to and the Big Salad is my favourite “fast food” to get for take out. I haven’t tried the kale chips but you have instigated a craving so I may have to go get “take out” later. Thank goodness its so close. I wish we had a raw restaurant in Calgary! The Coup is great… but something more would be nice too! This restaurant is in my neighbourhood, I have been twice and enjoyed it both times. Last time I had the beet ravioli and it is out of this world, I really need to find out how it was made. That food looks incredible – I could definitely go raw if I could eat like that on a regular basis! I’ve made them and they are the bomb! we have to go together sometime soon!! Happy Birthday! Such a great picture of you! 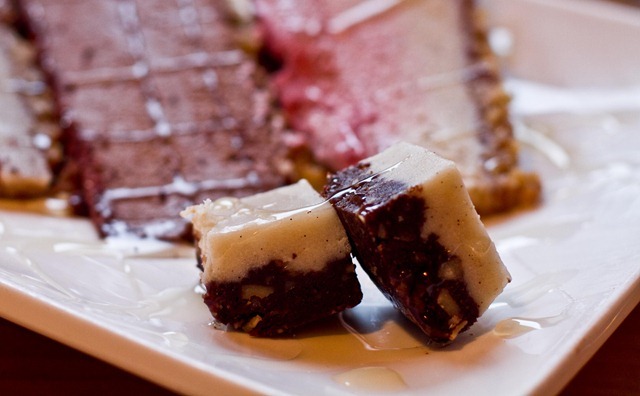 The raw meal you had looks fabulous, I love love love trying new vegan resturaunts – we don’t have many in Wisconsin. A wonderful review! 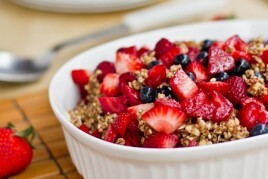 Raw food always excites me, mostly because of the amazing creativity involved in preparing that type of cuisine. On top of the awesome TO raw restaurants, there are also a handful of farmers’ markets in Toronto that have prepared raw food vendors (ourselves included!). It would be wonderful to connnect with you at one of the Toronto markets! Your photographs are always so stunning, and your recipes so yummy. Thank you for continuing to be a bright enthusiastic inspiration in all that you do! That looks like the perfect birthday dinner! We have a raw vegan cafe in town that just started, so they are still working up their menu base, but that pizza looks delicious! Everything looks delicious and you look beautiful! 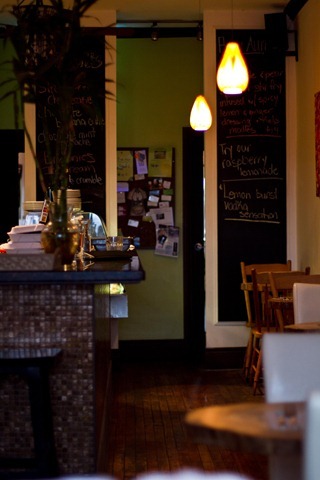 I have only been to a raw restaurant once (Blossoming Lotus in Portland) but it was great! Happy Birthday! The food looks delicious! I’ve only tried a raw place once and it was amazing how much it filled me up. For some reason I thought that I wouldn’t get full off all the raw foods (majority veggies) but it was plenty filling, delicious, and healthy. Would love to see you expand your raw recipe collections. I find raw eating so interesting. I can’t wait to start eating more this way. I am tired of calories, scales, bad advice I want to live and eat food that sustains me. Everything sounds so tasty and interesting. Um, looks like a great dinner, Angela! I am actually shocked that there is a Raw restaurant right here in Mississauga. That is the city I work in (but I play in Toronto) so I am pleased about this. I have to admit that although I am vegan, I am sort of afraif of raw food. No idea whythough.Thanks for the details. The only thing I don’t think I would like are the cakes. I am so not a fan of anything moussy. I have to think to swallow it–too marshmellowy?! I’m going to be waiting attentively for your version of sour cream and onion Kale Chips. VERY attentively. I am so so glad you had such a wonderful birthday :) You are beautiful and truly deserve it! Thank you for the review! You look simply gorgeous! Happy Birthday! Those kale chips sound divine. Please do try to recreate them! I’ve noticed that most restaurants dehydrate them instead of baking them and I’d love to see how that’s done. P.s. I just started my own blog and was wondering if it’s alright with you if I add you to my blogroll? Happy Birthday. That looked like a wonderful B-day dinner! I’ve never been to a full, raw restaurant. I’ll have to scour Boston for one. Want to take me next time? Hellooooo gorgeous! Happy Birthday again, sweetie. Wow all that food looks amazing, especially your salad. It sounds like you had a great birthday celebration over the past few days. 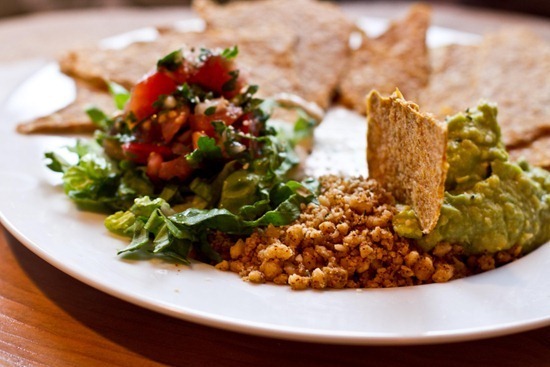 I went to a raw vegan restaurant in Minneapolis and it was the best food I have ever had! There is definitely something to say about the raw movement if you can have goodies like that. Your meal looked amazing. You have fantastic skin I must say! Happy Birthday! Happy Birthday! You are gorgeous!!! Oh my goodness it sadends me so much to see that I literally worked 12 minutes away from this restaurant for four months and didn’t even think of looking up vegan/raw restaurants! … instead I brought a lunch everyday (which didn’t disappoint) but those kale chips look seriously addicting. Hope you had a great birthday! You look happy! And the meals look delicious! And all of that food looks so amazing! 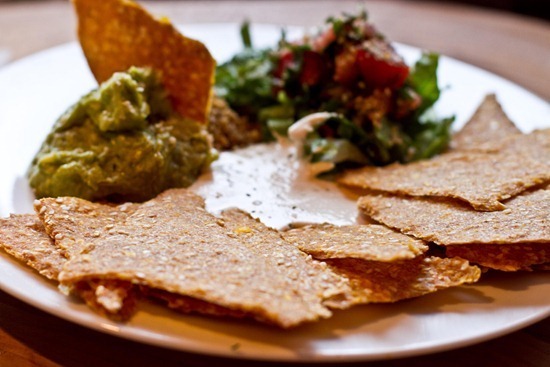 Especially those nachos and desserts :) I’ve never seen a raw food restaurant around me. You look so beautiful and glowing in that last photo. Definitely a very young 28. HAPPY BIRTHDAY!!! Everything looks wonderful! 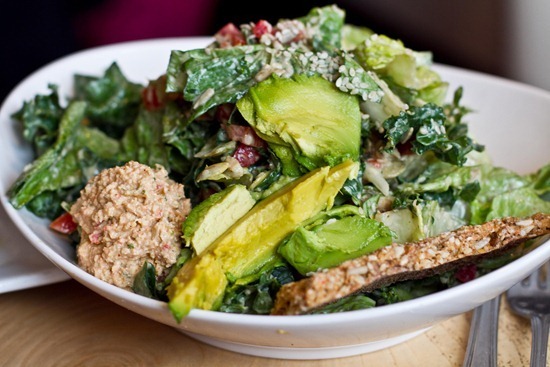 Eating at a raw vegan restaurant is on my summer bucket list. I hope my experience is as good as yours! Those kale chips sound so good!! WOW what an amazing dining experience!!!! 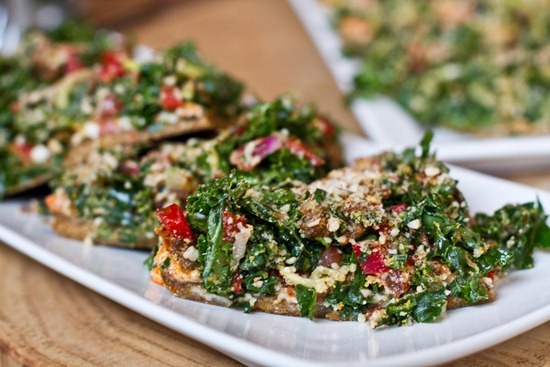 I have had raw pizza before and it is awesome! I would love to recreate it but sadly I don’t have a dehydrator! 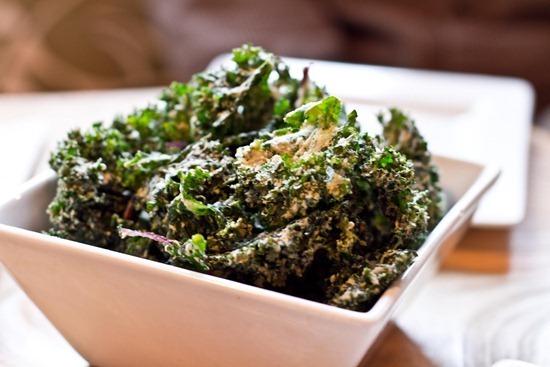 Anyways, everything about that meal sounds perfect….especially those kale chips! What a great flavor idea!!! Sounds amazing! I’d love to try raw pizza sometime. Gorgeous picture of you! All the food looks fantastic here, especially those nachos. That looks like an amazing birthday dinner! I’ve been dying to check out a raw food restaurant, but I don’t think there’s any way I could eat at one because of my nut allergies. :P I guess I’ll just have to find some recipes on blogs like yours and try to make my own raw meal! What a great dinner! 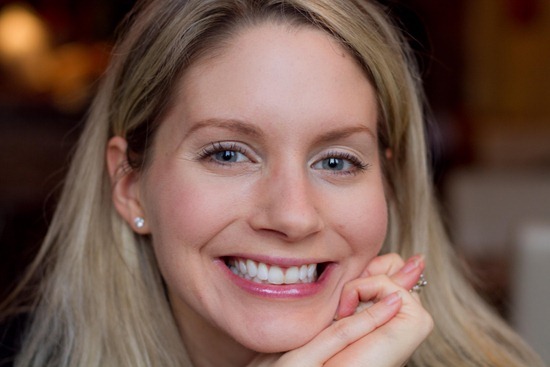 Happy Birthday – that photo of you at the end is beautiful! I was wondering if you could post some more information on live bread (what is it, have you ever tried to make it) etc. I love making bread and would like to hear more! Oh – double question post but what are your thoughts on hot yoga for a very very beginner to yoga? Too much to start with or go for it? This post had me drooling! The nachos sound SO good. What a wonderful birthday dinner!! So glad you both enjoyed! First off, happy birthday! I just started reading your blog and I love it so. It has really inspired me to revisit my vegetarian ways and start doing what I know my body needs. Thank you so much for that. 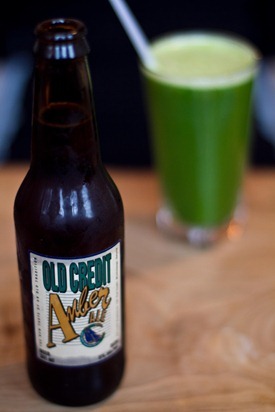 Secondly, I just had a green monster for lunch today. AMAZING. I can’t wait to have another one tomorrow. I already feel my skin radiating. Thanks so much for all your positivity and most importantly… doing what feels right! Those Kale chips are AMAZING. My husband found them at the heath food store in his mall. I finish at least 2 bags a week. Expensive, but worth every penny. I had the opposite experience of you. I loved Live, and really did NOT like Rawlicious.. I had the sunshine wrap from live, and it was delicious. and something else.. i cant remember.. the desserts at rawlicious blew my mind though..
oh and how rude of me, HAPPY BIRTHDAY!!!!! I LOVED this place. I live out west, but went there with my mom when I was visiting her in Port Credit! So wonderful. I was absolutely impressed with the restaurant. Glad you enjoyed it too! The picture of you is stunning! I wish I was there to share the desserts–they look delish. Glad you had a great bday dinner. I’m going to a Burmese place for dinner. I’ve bad Burmese once before and fell in love. The place I went had an incredible fermented tea leaf salad made in front of you . . . crossing my fingers that this place has one too! HAPPY BIRTHDAY ANGELA! YOU LOOK SO BEAUTIFUL IN THE PICTURE! Those kale chips sounds amazing…. can’t wait for your recreation! I agree, you’re utterly glowing with happiness :) So inspiring to see! 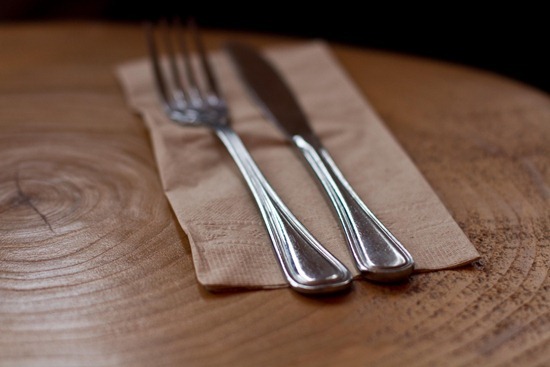 Question for you- What do you order at a non-vegan restaurant? I’m looking for safe options for when we need to go somewhere with a group! Happy Birthday!!! I live in Ottawa now, but am originally from Stoney Creek!! I would definitely check that place out the next time im in Southern Ontario! Thanks for the review. Some of my girlfriends went here awhile ago and loved it. I’ve been trying to talk my boyfriend into going here ever since but he’s put off by the whole raw food thing… I’ll have to show him all of the yummy stuff in your post, maybe he’ll reconsider. I’m glad you all enjoyed the restaurant and got to try so many wonderful things. That’s too bad about the beer. Bummer! I bet the awesome nachos made up for it! Yay for a Happy Birthday girl! :) The restaurant sounds great and food looks delicious. Happy to hear you enjoyed a wonderful time out for your special day! What a perfect bday dinner…and a gorgeous photo too! I found a Raw restaurant on my last trip to LA: Sun Power Cafe (Studio City). AMAZING!!! They had a lot of the same foods you ate last night. I look forward to you figuring out some of these recipes and sharing them on your blog! How do they do “Raw” tortilla chips and Kale chips without “cooking” them. Or is the rule of Raw that it can be cooked, but at a lower temperature. Please let me know if you know. Happy Belated birthday! A small Big salad. :-) Love it. Aren’t dehydrated kale chips way better than cooked ones? You must get a dehydrator just for these! The more you get into raw food the better for me because I eat a lot of it. And I know your recipes will be awesome. I’m so selfish, sorry. Oh my goodness! That last picture is gorgeous Angela! I wish my smile could light up the computer screen like that!